Set between two quiet canals in the heart of Amsterdam, Sofitel Legend Amsterdam The Grand boasts a rich history – from 15th-century convent to City Hall. Beautifully renovated, this central Amsterdam hotel blends sleek design with 5 star facilities, including 52 luxury suites and an indulgent spa. With an award-winning Bridges restaurant, Amsterdam’s first Raw Bar, a Vinothèque, Library and brown café, this is the perfect choice for the discerning business traveler or luxury stay in Amsterdam. The stunning Sofitel London St James is located in the former home of Cox’s and King’s bank in the very heart of London, England. This sympathetically renovated building is English heritage grade II listed and now houses one of London’s most unique five-star hotels – combining traditional British design with a contemporary style that is unmistakably French. Sofitel London St James has one of the finest addresses in London, right on the corner of Pall Mall and Waterloo Place. The hotel lies in the heart of St. James’s, a prestigious and lively district of London, within walking distance of St. James’s Park, Buckingham Palace and the renowned gentlemen’s clubs. The hotel is also less than a five minute stroll from Trafalgar Square, city centre theatres and the fabulous shopping on Regent, Piccadilly, Oxford and Bond streets. The hotel has the ideal location from which to discover and enjoy central London. Discover, in the middle of Paris and the 1er arrondissement, the Novotel Paris Les Halles hotel, which, with its ideal location and efficient service, will transform your Parisian journey into a unique experience. A place of memory because of its position in the center of Châtelet Les Halles, the hotel was built on the ancient traditional marketplace described in Zola’s work as “the belly of Paris”. A place of innovation with its decoration and equipment, this hotel’s style is constantly developing, only to become a unique, elegant and cozy space within the capital city. Worthy of its four-star rating, the hotel is perfect for a stop in the heart of the historical area of Paris. Near the eight subway and RER train lines, the Novotel Paris Les Halles hotel is located steps from Notre-Dame, the Pompidou Cultural Centre, the Louvre Museum and the quays of the Seine river. The hotel is located only a few minutes away from the Place Vendôme, the Bastille, the Place des Victoires and the Grand Department Stores. Here, you are at the junction between the Marais and the Faubourg Saint-Honoré. Surely you will also appreciate the proximity of Disneyland Paris and of the Charles de Gaulle and Orly airports, located less than an hour away from the hotel. 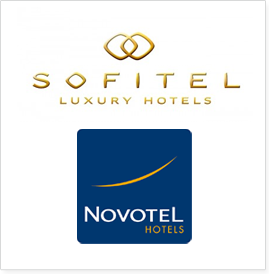 The Novotel Les Halles Paris hotel’s 285 rooms, its play area, its eight high technology lounges and its patio are at your disposal to make your stay memorable and comfortable, whether it to be for work or with your family. Located only steps from the Bell Centre in the heart of downtown Montreal. Novotel Montreal Hotel is appropriate for all types of travellers, whether it be for business or leisure. Novotel Montreal Hotel’s downtown location means we’re close to financial and commercial districts, restaurants and the Bell Centre, home of the Montreal Canadiens. These and other city center attractions makes Novotel Montreal Hotel an excellent location to stay or to be found. From your room admire the view of downtown Montreal or the Museum Quarter, relax at our bar enjoying a glass of wine from our cellar, or keep in shape in our new hi-tech exercise room. The technology of our multimedia meeting rooms is surpassed by no other hotel in Montreal. Have a bite at L’Ô before taking a walk on Ste-Catherine street, known for its shopping and boutiques, or dive into the night life on Crescent street, both situated next to the hotel. Enjoy our full service property instead of no name discount hotels. Novotel Montreal Hotel offers quality services in a relaxing atmosphere of modern comfort. The team at the Novotel Montreal Centre hotel and the City of Montreal are waiting with open arms! The Novotel Ottawa hotel is ideally located in downtown Ottawa in the heart of the Nation’s Capital. One of the finer Ottawa hotels, it offers its clients a warm, cozy and intimate accommodation experience. Novotel Ottawa Hotel specializes in personalized, friendly services in a quiet stress free environment. You will find our staff attentive and they have no reservation to listen to the needs of the modern traveler. Our Ottawa hotels peaceful and serene ambiance awaits you in any one of our 282 contemporarily decorated guestrooms, as well as our 6 meeting rooms. Housed in a 19th century landmark building, and part of the Novotel Ottawa hotel, our Novotel Trio Restaurant invites you into a gallery-like restaurant atmosphere. Warmed with exceptional charm, service and style, exquisite works of art are found both on our walls and on our menu. The team at the Novotel Ottawa hotel and the City of Ottawa are waiting to welcome you! Reserve your Accommodation and experience now! Nestled in the heart of Edinburgh, the ibis Styles St Andrew Square is an ideal base to tease tales from this mysterious city. Ibis Styles Edinburgh Centre is in the new town district, close to Princes Street – ideal for shopping & George Street for bars/clubs/restaurants. Edinburgh Castle, Royal Mile, National Gallery are close by. Edinburgh Airport Shuttle bus/Waverley train station are 6 min walking distance. 103 rooms with the Sweet Bed by ibis Styles. The hotel is full of character and maintains modern functionality with a nod to tradition. Purple, green and blue bring a distinctive Scottish hue which is enhanced by funky furnishings such as wee whiskey barrel nightstands and wry Scot-slang friezes which educate as well as inspire. Take a course in Scottish slang as embroidered carpets with local lingo take you on a winding journey through the country’s colourful use of language. Illustrated murals in each room tackle different Scottish themes, meaning you might fall asleep in a field of thistles or be woken by the glare of a highland stag. And of course, where there are trimmings, they’re in tartan.